In one of the talks at SaaStr, Maia Josebachvili VP of Marketing and Strategy at Greenhouse Software, shared a way to measure the ROI of your human capital: Employee Lifetime Value (ELTV). 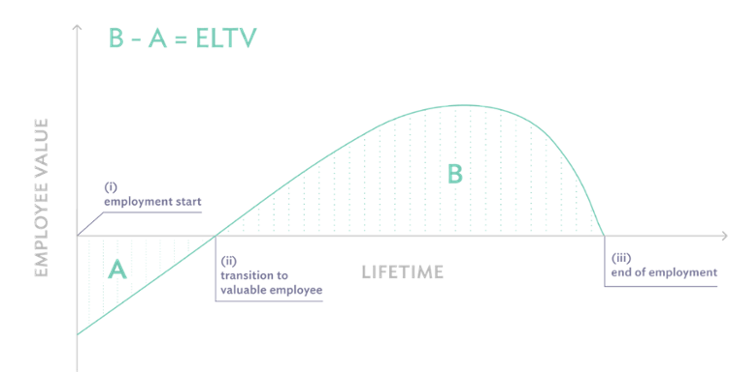 Long story short: ELTV is a KPI built to help you get the most out of every employee you hire. Companies are obsessed with ROI and want to calculate the return of every euro spent. But one thing still remains unclear: the ROI of their workforce. Gaining the maximum out of human capital is in every company’s best interest. That’s why understanding ELTV or Employee Lifetime Value is so important. For some departments it’s a fairly easy exercise to calculate the return. Marketing calculates how much money they need to generate x amount of leads. The Product team, in turn, usually has a roadmap that includes the time and headcount needed to deliver certain features. But for HR, it's different. The cost of an employee is easy: their wage. Yet the return often remains a question mark: you know exactly how much you invest in people, but it's hard to know what your results are in the end. The basic idea behind this chart: when employees start, they cost you money. But as time progresses, their output starts to pick up. After a while, the employee reaches a peak and produces maximum input. The ultimate goal of Employee Lifetime Value is to maximise the output of the employee. Onboarding: decrease the time required to get someone on board and by helping them get off on the right foot, increase the likelihood someone will stay. Hiring: great hires have a higher input from the start. They learn quickly, are eager to get started and show genuine interest in your business and core activities. Development: promote self-learning to increase the value someone can bring to your organisation. Management & culture: instead of micromanaging, introduce a management practice with room for individual input and growth, and a positive culture - encouraging proactivity and intrapreneurship. 1. Faster onboarding program: do you know how much time it takes to get a new employee up and running? Try to reduce this time: tell a new hire what they can expect before they start, create a checklist for important to-do’s on day one and keep the schedule for the first week organised and tight. 2. Make people stay longer: company culture makes up a great part of why people stick with your company. On top of that, giving them enough training or resources to get their job done, autonomy in their job and appropriate rewarding is a deal-maker too. Just regular training moments alone can have an immense effect on employee retention. 3. Ramp performance of people to a higher level: empower employees to create and plan for their own success to increase their accountability. For example, let them determine their own goals and then agree on clear deadlines. A team that feels valued, with access to the right resources, will reach better results. By applying the winning principles mentioned in this blog, you'll easily increase the ELTV within your organisation by almost sixfold. Measuring and improving that ELTV is a surefire path to happier employees, better culture and higher revenue. If you have a strong and qualitative HR team, they will pay themselves back quickly.